Located in a peaceful corner near the Mekong River, the Buddha Park just outside of Vientiane, Laos, has become a bizarre-yet-enjoyable attraction. Locals refer to the Buddha Park as Xieng Khuan, which means 'Spirit City.' Forget the typical Buddha images seen in temples across Southeast Asia; the Buddha Park near Vientiane contains over 200 sometimes-menacing statues portraying Buddhist and Hindu lore. A 390-foot-long reclining Buddha is the crown jewel of the collection. The religious-themed statues are spread over a peaceful lawn and certainly capture the attention of all visitors. A three-story dome allows visitors to enter through the gaping mouth of a demon and then climb staircases through the dark, dusty structure from 'Hell' to 'Earth' and eventually emerging at 'Heaven' on top of the dome for a spectacular view and a chance to take great photos of the park. The Buddha Park was put together in 1958 by a priest-shaman named Bunleua Sulilat. Also known as Luang Pu, the creative mystic left Laos during the 1975 revolution and eventually died in Thailand in 1996. Another one of his strange parks is located in Nong Khai, Thailand, near the border with Laos. Although the enormous stone statues appear centuries old and are extremely photogenic, most were actually constructed in place rather than transported to the park. Entrance: 5,000 Lao kip. Cameras cost an additional 3,000 Lao kip. Plan on at least two hours to fully appreciate the park at a leisurely pace. Food and drinks are available in a simple restaurant in the back corner of the park. Small booklets are available that describe each statue and the theme portrayed. Many statues are symbolically oriented toward the east with the exception of a select handful that face west to represent death. Arrive earlier in the day to have the sun at your back for better photos. Buddha Park is located around 15 miles (24 kilometers) outside of Vientiane, just east of the Friendship Bridge connecting Laos to Thailand. Plan on around an hour to get there due to traffic and poor road conditions. 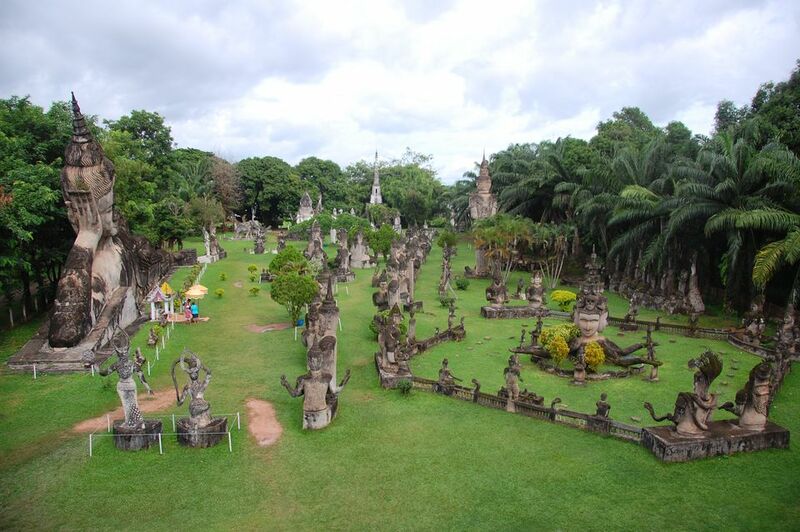 The easiest and most reliable way to get to Buddha Park is simply to arrange transportation for the day from Vientiane; no need to book a tour through an agency or your guesthouse. Approach a tuk-tuk directly and haggle for the best round-trip price. Depending on the driver's temperament and your negotiating skills, you should be able to find a round trip ride for less than 90,000 Lao kip. To enhance the adventure and save a little money, you can make your own way to Buddha Park by walking to the Talat Sao bus terminal and taking bus #14. The large bus leaves every 20 minutes and costs 6,000 Lao kip. Look for bus #14 at a stand near the back of the terminal. Your bus may terminate at the Friendship Bridge where you'll have to switch to a smaller minibus for the rest of the journey. Ask your driver how to continue on to Xieng Khuan. The beat-up minibusses only leave when full and will offer you a spine-rattling ride straight to the entrance gate for only 2,000 Lao kip. When ready to return to the city, you'll have to flag down the last minibus at the entrance gate of the park or team up with someone else for transportation back to the Friendship Bridge where you can then catch bus #14 back to Talat Sao.